Oh yes it’s a beautiful book Elizabeth. I’d drafted a ‘my 5 favourite books of September’ wrap up post (I write for another blogger) when I started this, so had to read it in a sitting so I could decide if it deserved a place. Needless to say, something else had to go as it well and truly deserved its spot. As per my desperate #argh-ridden FB conversation with you, I’m a very literal reader so I worried about what I was missing on a metaphorical level and the logic-lover in me needs to understand what happening. Although having said that – while I don’t fully understand the ending I complete accept it as it is though will continue to wonder…. It’s most certainly a book you think A LOT about after you’ve turned the last page. Wow what a powerful review. I’ve been intrigued by this book, but I’ve read so many angsty, angry books lately that I’m in rather desperate need of something lighter. A novel I’ve read recently but have yet to review is Hannah and Emil by Belinda Castles. That is definitely lighter, but still very moving, and I think you’d enjoy it. Having put that out there, The Natural Way of Things isn’t as heavy going as you might think from its subject matter. I think that’s due to Wood’s wonderful, wonderful writing. Brilliant review and I agree with you about the prize predictions! Thanks for the review, Elizabeth. I’ll have to create some time and mental space and read it. Fantastic review. Like you, I need everyone around me to read this book so that the discussions can begin! I finished reading this a day ago. It only came out this month in the UK, so apologies for being 9 months behind your post! I, too, feel the need to talk about the book and how it made me feel. I picked up on the internalised misogyny aspect as well, and it surprised me to acknowledge that I feel a certain level of self-hatred. What you say about the women in the story who display self-hatred remaining at a distance, and Yolanda and Verla being more empowered is important. I think Wood has done a positive thing in acknowledging that societal attitudes, stories in the media, negative experiences, etc, etc, create that internalisation of self-hatred, while also modelling in Yolanda and Verla a way to break out of it. For me, that’s what the ending was about. The other women are still accepting the lies in the hope that it will turn out well. Yolanda and Verla finally understand that the only way it will turn out well is if women take control of their own story. The thing that surprised me was that the women who formed a mutual support group weren’t empowered by being in that group. Only the two characters who fully separated themselves were empowered. I’m still chewing over how I feel about that. Jan, your comments are spot on. I hadn’t considered the “support group” versus “individualism” aspect: more food for thought and reason for unease. Thanks for seeking out this review and adding your take on the story. 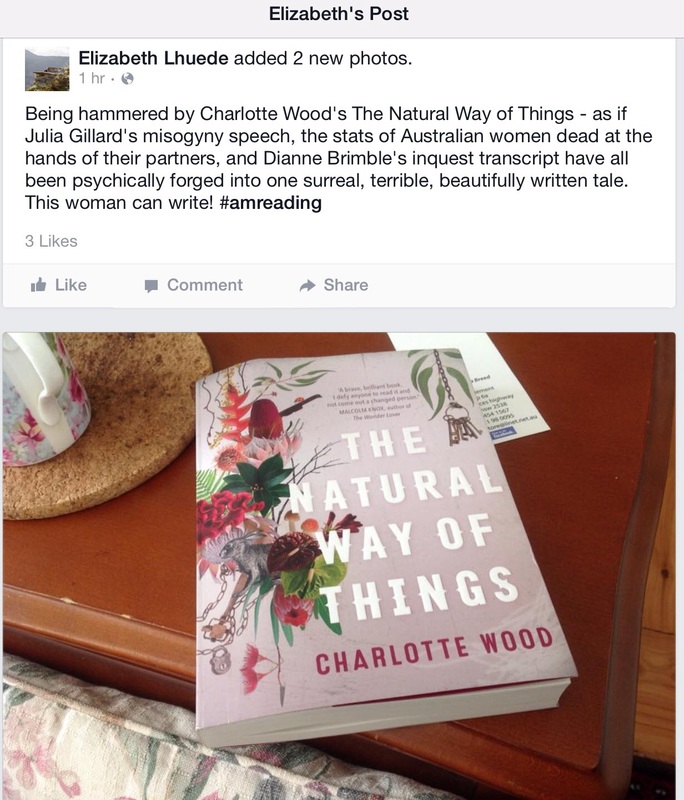 I’m thrilled for Charlotte that her novel is still creating thought-provoking conversations. [spoilers] I agree with your interpretation of the ending, Jan. The women on the bus were seduced by the idea of returning to “normal.” Verla and Yolanda have now recognised that their previous “normal” life is not a life they want. I still feel uneasy about the message that only two of the ten women seemed to recognise this and find some agency. It’s perhaps not unrealistic, but pretty depressing. The “bags” part was my only disappointment from TNWOT. I found it to be immensely readable, and surprisingly beautiful in its use of language, despite the horrors of the subject matter. I thought the bags worked as an indicator that, in some circumstances, our over exposure to advertising messages about who we’re supposed to be makes us behave like Pavlov’s dogs. The bags were a bell ringing, igniting in the other women a false hope that things would go back to ‘normal’. Especially the women who had been grooming each other throughout the book. I thought it was a reasonable way to end the book for those women, and a vehicle for Yolanda and Verla’s endings. Thanks for sharing your thoughts, Elizabeth. This is indeed a fantastic book, well-written, gripping and surprisingly beautiful given its subject matter. Definitely does need a trigger warning but I thought Wood goes just far enough in the horrors – letting the focus remain more on the misogynist attitudes than the physical results of those attitudes. I’m still mulling over the ending (see my reply to Jan’s comment) and keen for discussion. I only realised the past/present tense thing after reading reviews (I avoid all reviews prior to reading a book – way too many spoilers! Including the cover flap blurb.) I’m surprised I didn’t realise as I was reading – I think you’re right in this being a sign of the sophistication of Wood’s writing. Anyone have thoughts on the metaphor on this? Some immediate thoughts – Yolanda is written in past tense to signify her leaving her body / being separate from what’s happening. She’s distant from the events of the past and of the prison. Whereas Verla, for most of the novel, holds hope in rescue of some kind. Thanks for your comments, Ella. (I saw then when you posted and couldn’t reply because of a dodgy internet connection!) It’s great to hear your views – especially as both you and Jan pick up on different issues. I have a hunch this book will be mulled over for a long time to come!